The geological column is a tremendous blanket of sedimentary rock that has been found to cover the entire earth. Layers of flood liberated deposits of sandstone, limestone, and shale completely cover every landmass by hundreds of feet. This thick strata has been interpreted by secular scientists to represent the history of life on earth over more than 600 million years. Except where erosion and uplift has removed these layers, there is not one square inch on earth not covered in thick flood strata. The geological column can be traced across entire continents and correlated with similar layers on other continents. The following map of the united states is a US Geological Survey illustration showing the various layer of the geological column exposed nation-wide. Some layers of strata such as the Mississippian and Pennsylvanian were named due to their discovery within these specific states of the US. It is not uncommon for sedimentary rock to be kilometers thick in places. The depth and quantity of these beds is so extensive that a mechanism for their deposition is almost unimaginable, and it would appear truly miraculous that terrestrial life still exists upon so much flood sediment. Simply put, the geological column has been misinterpreted due to a failure of the scientific community to recognize the occurrence of the global flood, and there is evidence these formations are relatively young. The flood strata does not represent a history of millions of years of accumulation, but is an obvious record of a world-wide devastating catastrophe that nothing was able to survive naturally. The fossils found within the geological column are sorted or frequently only found in a few specific layers. It is thought this differential positioning illustrates the history life on earth, and the evolution of one type of organism to another. 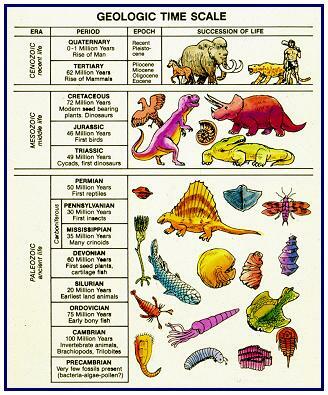 However, the sorting of fossils is instead simply the result of varying death rates of animals during the flood. The flood waters did not reach their maximum for 150 days following the start, and organisms are expected to die at different times during such a flood due to the possession of differing habitat elevations, environmental tolerances, migratory potential and intelligence. With rare exception, all the animals in the geological column were alive just prior to the flood. The fossils found deepest within the geological column are simply immobile and inhabit the lowest elevations possible on earth. Organisms that are increasingly mobile, tolerant of change, and intelligent are expected to avoid the rising waters depending on their abilities and succumb to the catastrophe at different times. Because every animal in the fossil record was alive on earth together, exceptions to their current position are certainly expected, and there are indeed hundreds of documented anomalously occurring fossils. Humans are expected to have been able to recognize the event for its’ magnitude and therefore act accordingly in avoiding death to the very end. For that reason, humans are not expected to be found fossilized except on rare occasion, but we can still expect to find human artifacts deep within the geological column. We could also predict examples of living animals like the Coelacanth whose living presence contradicts the fossil record. Evolutionists will need to continue to adjust their position of when organisms evolved because they have misinterpreted the fossil record. With each new discovery they will need to say humans evolved earlier and earlier than previously expected. Next PostMutations or Genetic Recombination?